Spend more or less on holiday gifts this year? As soon as the Thanksgiving turkey, stuffing and pumpkin pie are polished off – millions of Americans turn their attention to Black Friday, one of the biggest shopping days of the year. 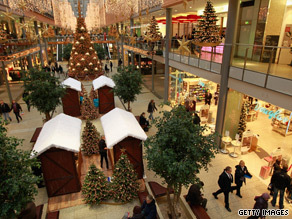 What's yet to be seen is how the shaky economy and troubling forecasts are going to effect holiday spending this year. The Federal Reserve now says to expect weak economic recovery for several years. Some policy makers say it could take 6 years – or longer – before unemployment, growth and inflation return to more normal levels. Meanwhile, taxes are set to go up for 90 percent of Americans if the "Making Work Pay" tax credit expires at the end of the year. Never mind all that. The American consumer is apparently ready to spend. A survey by the National Retail Federation shows people plan to spend about $689 on holiday-related shopping this year. That's up about $7 from last year. They say most of that money will be spent on gifts for friends and family. The rest of it will go to co-workers, decorations, food, candy and flowers. The survey shows the $393 that consumers plan to spend on family and friends is the highest it's been since before the recession hit. But partly because of the recession, consumers are still looking for bargains, which is why many stores started promoting their Black Friday sales right after Halloween. These discounts usually drop prices by 20 to 30 percent. Here’s my question to you: Do you plan to spend more or less on holiday gifts than in years past? Much less. I lost my job last year and finding another job in this market is very difficult for an older woman. My family understands and knows that I will not be able to give like I used to. Heartbreaking for me, but life is difficult and we all must do what we must do. I will probably spend more than last year, but that isn't saying much. Last year was the pits and any movement can only be up. The outlook is better now than it was 12 months back. The job situation is slowly improving, the markets are doing better, and one more thing – we are in a new normal, and people are getting used to this new normal. Last year, people were still in shock. Kids are definitely expecting more. A poll of 2,500 kids taken last week by kids' blogging site tweentribune.com shows that kids who said "more" or "a lot more" outpaced kids who said "less" or "a lot less" by a 2 to 1 margin. The big items driving the spending for their families were electronics, like games, cell phones and laptops. Really interesting comments from the kids - a lot seem to equate what their parents will spend with how much the parents love the kids. This year my whole family (7 adults ranging between 19-62) decided to draw names and buy for one person with a limit of $100. We are doing this in an effort to save money and keep a little extra money in our savings/banks. Typically, I spend between $600-$750 each year on just my family. Jack, I only spend as much my wallet allows. I usually put in $500 cash and go off on my shopping spree. Once all the cash is gone, then I've reached my limit. About the same. Getting too old to become a Scrooge. One big present for the wife and one each for the kids. Toys for Tots for the rest. Happy Holidays, Jack, to you and your family. Let's all remember the least of our brothers. The saying is less is more and I hope everyone will be happy with less because everyone on my list is getting less. In my case probably about the same as last year or less if I can. Another lean year means another lean Christmas. I don't need anymore personal debt than what I already have. Jack: I will probably will spend $250 to $ 300 more than I did last year. I will spend more and cover more of my family with a present. I am more positive this Christmas Season. Plus it is definitely better to give than to receive. I will make a special effort to help those less forunate than I with a better contribution to United Way and the Salvation. I am truly blessed . Didn't spend much last year, not going to spend any more this year. Name of the game is savings, not consumption. Didn't you all learn that yet? As long as the children are provided with a safe and happy Christmas, I don't intend to spend any money or buy any gifts. Love and keeping Christ in the middle of this holiday, is what I intend to do. All this buying hype has got to stop. It's so irritating to find Christmas specials and Christmas discounts during the Halloween events. That is scary! About the same as last year. A sugar free candy cane for each of the grandkids, a bag of unsalted chips for the kids and a small bag of chocolate for the wife. Hope that meets with everyones approval. I plan to give all those whose path I cross a listenig ear, an encouraging word, a big smile and most of all some joy out of laughing together. A little more actually. And we're flying to another country. We did not spend any money on gifts last year and will not this year. Instead, we shall take care of home repairs and focus on the real meaning of the season. We will spend way less, just on the grand kids. I'am sure all our corrupt politicians will have a wonderful holiday paid for with all the stolen tax dollars, or what ever else perk they can steal. Our government is sinking very fast. I can't wait until there is no more ways for us little guys to pay these corrupt idiots pay check, then see how things change, are you listening Nobama? Perhaps more...... if the price of coal went up from last year! Everyone we know is spending less. There are those with needs of "food", etc. that are more important. About the same. Getting to old to become a Scrooge. We will spend the same amount of money this year for holiday gifts as we did in past years. We have not been affected by the recession here in TX. And we also know how to manage our money. So have a great Thanksgiving, Jack! The same amount gift card they always get and if they don't shut up and become grateful that I give them this next year will not get anything. I do not have to get you anything. People have forgotten what Christmas is about. They are too materialistic and my giving is from love because I am unemployed and want to give them something. So far I am spending less this year then any year before but that is of my own doing. I promised my friends and family that I would only buy things made in America to give this year as gifts to help stimulate our own economy. What I have discovered is there isn't much made in America any more and what I have found is worse then anything I ever bought that was imported. Perhaps that is the problem with our economy. Not that we don't buy things but that none of it is made by American workers any more. I even saw a Japanese Santa Claus at the Mall today. I hope you all have a very happy holiday season at CNN. I don't consider the holidays a special day to give gifts or consider a spending amount. I get and give any day of the year, but if that day falls during the holiday gifts season, than is just another gift. Jack, I finally found work after over two years of unemployment. I will definitely spend more on gifts this year. I will buy some. About the same as last year: A bottle of single malt for him, Irish cream for her, premium vodka here, gin there, and beers of the world for me. Get a bottle of wine for the family dinner and we are done. $150 tops! I pretty much spend the same amount. I shop all year long and buy things when they are on sale and put them away. I will not be in any of the stores,other than grocery,because I can't stand the crowds. That is why I get my shopping done before Thanksgiving. By the way Jack,"Happy Thanksgiving " to you,Suzanne,Wolf and ALL the Situation Room crew! Less, much less. Remember its the thought not the gift. Everything that I buy is made in China.If I buy sometning made in Europe I have to spend big bucks because the dollar is only worth 75 cents to the Euro.WHY? Being out of work for 18 months I am far more worried about the next meal for my dog and myself than about Christmas gifts. The chorus from a 70's song, "Big Yellow Taxi," is the most accurate: "Don't it always seem to go that you don't know what you've got till it's gone." Amen! I plan on spending way less than in other years. My husband has not worked in two years. That puts a real crimp in our spending! Definitely less. 90% of the merchandise out there is crap made in China or Mexico or some other corrupt country that has been the beneficiary of the out-sourcing frenzy of corporate America. We spent much more than year's past. The kids are old, own houses and need big things like kitchen cabinets and beds. Things that are much more than a board game or a Barbie doll. We're definitely going to be spending less this year on gifts. We have two more great grandchildren to add to our family. But I still consider us lucky because we have money to buy gifts. There are so many people that just don't have the money. It puts me in mind of the Tiny Tim days when there were just peasants and the wealthy. I plan on spending about as much as I did when times were good. The reason why, is because I have been cutting corners all year to save money and I have kept myself out of debt. I think this years Black Friday sales will be about what they were the last 2 years. Jack I hope you and your family have a wonderful and safe Thanksgiving. God bless you! tampa, fl since i didn't get a cola this year, and my dog needs an operation on friday, i sat down and did my xmas cards this year today. not one had a check in it, only my thoughts and best wishes. i wanted to send a few to my congressmen & president, with my thoughts (no check too) but ran out of stamps. last guy that tried to tell them what he thought should happen to them was arrested, so i guess i'm lucky. Jack, I'm not in the group that has been reaping the benefits of increased profits on the backs of average Americans. Notice that the "average" American will only spend $7 more than last year. If each person making over $200.000 a year spends $70 more, that would take care of them-self and nine others, and would still leave us average folks with a simpler Christmas season. But that's OK, because Jesus is the reason for the season, and he doesn't ask for presents – just our love and our time. one big present for the wife and one each for the kids and toys for tots for the rest.Happy Holidays Jack to you and your family. Let's all remember the least of our brothers. I plan to spend more and to spend it only on American made products. That will be my gift to our economy. The public does not have the courage to take control of the economy or their personal finances. Instead we are led around by the nose by advertising, credit card thieves, Wall Street manipulators and a government that aids and abets their cheating ways. Consumers could stop all their unethical practices by simply banding together and stop buying gas when prices are raised without a valid and real reason. Cut up credit cards that charge usury amounts of interest. Close bank accounts that tack on fees that are unfair. Demand our Congress standardize credit card charges and interest. Don't use credit to make purchases. Spend less when being ripped off. Spend more only if you can afford to. But unless we join together in protest, it will be dirty business as usual. Consumers have the power...let's use it. Do you plan to spend more or less on holiday gifts than in years past? I've been unemployed since 2006 when GW thought that having 3 part time jobs to make a single full time salary was great! Jack, only because the price of CHINESE goods have forced me to. Remember the good old days when you bought an item made in either USA or Canada and you could expect it to last more than a week. In most cases it would last for years. Now you buy crap that is imported by Canadian or USA suppliers and and you are lucky to get it home before it falls apart. To be honest, i will spend LESS. Jack, As someone who's self-employed, no way am I spending money that will drive me even deeper into a hole. We hear the same song from the "U.S. Chamber of Commerce" every year about how "The Unwashed " shall shop till they drop. Baloney! If this were true, why is it that they always pray for the 1%ers to go wild? I have a sister who's in middle-level apparel; lota lookers, very few buyers. Her store has been running sales almost every week for the last three years; nothing! Wake-up America, you're being played for a fool. Layne A. Antioch, Il. About the same as last year, which was a leaner year, to start with. Less. Staying away from Black Friday. I could only imagine it will be worse than last year. Last year, I didn't get much of anything because people were crazy. Now that there is more incentive to spend less, I have no interest in fighting for gifts. Rather go empty handed this year than stressed out. Yes I do. And I intend to spend on US made items only. Time for all of us to wake up and take matters into our hands. Don't wait for the politicians. Don't wait for another stimulus. Make our own stimulus. I only spend as much my wallet allows. I usually put in $500 cash and go off on my shopping spree. Once all the cash is gone, then I reached my limit. I plan to spend more so the Chinese people can get a raise and start making $16 a day while I collect my unemployment check and food stamps. Definitely less. Between much higher medical expenses, climbing debt, and no prospective increase in salaries, we have to limit our spending to less than $400. Try that with 17 grandchildren all over the country!! I will probably spend more than last year, but that isn't saying much. Last year was the pits and any movement can only be UP!! The outlook is better now than it was 12 months back. The job situation is slowly improving, the markets are doing better, and one more thing – we are in a new normal, and people are getting used to this new normal. Last year, people were still in shock. I am spending less, much less. I do not have a mortgage, paid. I do work but I am seeing EVERYTHING go up..
where the is the deflaction they are talking about at?? And yes, I am scared, when are the handouts ending? And when can I work for ME???? Probably not. I'll still end up giving the same old Peace on Earth and Goodwill towards Men, as long as it's not out of my price range. I'm not spending a dime. I quit the whole holiday mess years ago. Do not expect a gift from me, and I don't want one from you either. How can people keep on going through the same charade decade after boring decade? The only excuse is if you have children, and that's no excuse at all. For whatever it is worth: I receive $1,200 per month in unemployment benefits and after paying for rent, electric, and basic essentials I have no money available for anything or anyone else. A lot of good my Masters in Education Degree is in an era of teacher reductions and layoffs. I did purchase some books at our local library for 50 cents each to give to my grandchildren, so in some respect . . . I continue to believe in the spirit of Christmas and sharing for family and friends. Yes, Jack, I am spending more on my dog and the squirrels that come to my back door for food and I am spending less on those annoying humans in my life. It doesn't matter Jack, how much you spend on gifts doesn't determine how memorable the holidays are. Christmass is not about how much money spent on gifts but about how much time spent with family and friends, you can do that no matter how bad the econmy. Less, as in zilch. I don't have kids. My parents and siblings are all gainfully employed, as am I.
Heck with the spend-a-thon - we put all our energy into making (and eating) an amazing holiday dinner and enjoying the gift of each others' company! Too much uncertainty = much less spending.Our family and friends started gifts to the young ones only last year and it was great! A real relaxed wonderful Christmas. Jack, I see no problem spending more than usual even during this economically unceratin time. Our resilience as a nation can often be measured by our willingness to fearlessly enjoy the finer things in life and that confidence will no doubt, as a byproduct, improve our overall economy.